encourage the use of alcohol, tobacco or drugs. Here in Saint Matthew’s Academy we are determined to ensure our young people can achieve their potential in every aspect of life and work within the school. This ambition includes aspiring to the highest possible standard of school uniform. Trousers and skirts should be smart and modest and extremes of fashion should be avoided. Hipsters, denims, shorts, tracksuit trousers and casual trousers are not permitted. Jumpers and cardigans should be plain (i.e. no logos) and should allow the school tie to be visible. All items of clothing should be clearly labelled with the child’s name in case of loss. This school dress code has been agreed through consultation with parents. Both the crested and striped school ties will be available for direct purchase from the school at very reasonable prices. 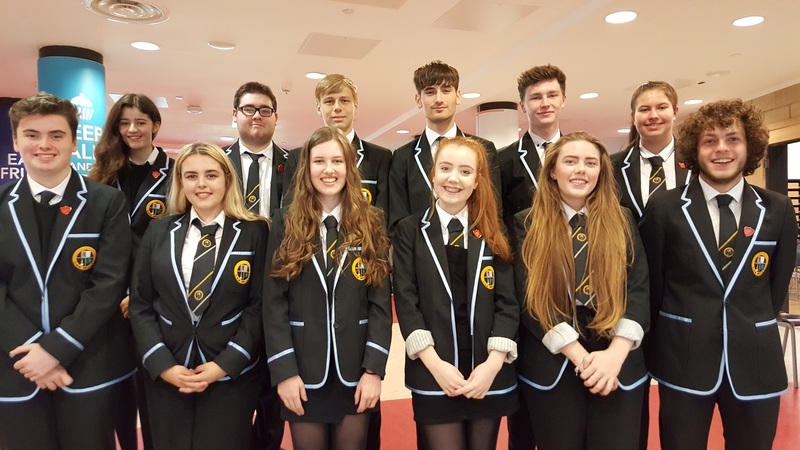 A fitting and ordering service for school blazers will take place prior to the summer break. Parents receiving jobseeker’s allowance or income support, family credit, housing benefit or council tax rebate will normally be entitled to grants for footwear and clothing for their children. Information and application forms may be obtained from schools or from Education & Skills, Cunninghame House, Irvine, KA12 8EE.